This week, we decided to try Da Vinci Gamesâ€™s Maestro Leonardo, which has received quite a bit of praise since it first appeared in the middle of last year. 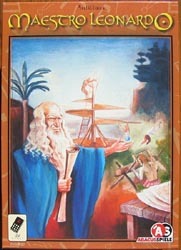 The game is about great inventors in Renaissance Italy competing to develop and complete inventions. Players assign workers to research labs or to areas of the city to collect components, recruit more workers or upgrade your lab. Completed inventions bring monetary reward and, if first to complete a particular invention, a discount towards the research needed to complete further inventions of the same type. A) Laboratory Phase, where each player declares if he going to work on a new invention. B) Assignment Phase. Players in turn assign workers to various tasks. C) Employment Phase. The benefits of each area are distributed. Each city area has a maximum of four rewards to distribute at increasing cost; research workers add to the amount of time spent on developing an invention. D) Research Phase. A player who has completed the required time working on an invention declares it complete and collects the listed number of florins. After 9 rounds, the game ends and cash bonuses are awarded to those who have collected invention cards in at least 3 different types. Most Money wins. We decided to play the standard set-up for our first game and we all complained about what bad starting positions we had. In hindsight, I think they are reasonably balanced but mean different players have to approach the early rounds in different ways. Mark K was the component king, making sure he had ample supply of resources before really starting on any inventions. I ran with one lab for a large part of the game and managed to get 7 and 15 research week inventions completed before splashing out on a second lab. Nige kept picking away at the cheap inventions and had a fair bit of success. Mark G started with lots of workers and built up his band of followers even further. Annoyingly, he also seemed to decide to place workers time after time in exactly the places I had just played. John unfortunately also seemed to be having more than a fair share of bad fortune and didnâ€™t spot a few threats from people meaning he couldnâ€™t afford to do what he wanted. Money did seem pretty tight. It was difficult to tell who was doing well and the scores at the end proved why. Nige managed to get a 13 florin bonus and the two Marks the 8 florin bonus. I missed out on the bonuses and had to settle for second place on both my last two inventions. If either one had come through I would have won but it finished with Nige and the two Marks all tied on 45 florins. Nige was ecstatic when the tie-break went in his favour. Leonardo is a very good game, with lots of routes to victory and plenty to get your teeth into. Being our first attempt, it took a bit longer than we would have liked but Iâ€™m getting used to our thoughtful approach and Iâ€™m sure a second playing would be considerably quicker. Another fine game: all three in 2007 so far have been winners to me. A few days ago, Iain Cheyne showed what I thought to be a good amount of initiative by taking the content of the faq on the uk.games.board message board and posting it as a wiki on Boardgamegeek . The intention was to have a place to which people could be directed if they wanted info about boardgames in the UK. The use of a wiki meant that it could be easily amended and updated, overcoming a disadvantage of the old message board, which was several months out-of-date. The response from those that saw it was very positive, me included, but what Iain hadnâ€™t done was check with Chris Dearlove, who maintained the faq on uk.games.board, that it was ok to make use of Chrisâ€™s information. Unfortunately, Chris was a bit peeved when he found out and I donâ€™t know whether this is going to be resolved or whether Iain will have to remove the information from BGG. I do sympathise with Chris, who may well have agreed if asked by Iain for permission to proceed, but I do feel that uk.games.board does not get enough visitors these days for such a valuable tool to be sited there. Do we need a resource to collect the kind of information about the UK boardgames scene that has previously held on uk.games.board? Is a BGG wiki the best way to host it or is there a better alternative? What information should it contain? We donâ€™t want a UK version of BGG â€“ that site does a tremendous job â€“ but what sort of stuff should a UK focussed resource include? How should it be maintained and what degree of moderation / management would be needed? I’d really be interested in hearing people’s thoughts. This week, we tried out Imperial, the sister-game to Antike, by Mac Gerdts and published by eggertspiele. The game is similar in that it uses the innovative rondel mechanism from Antike to determine what actions are to be carried out. However, unlike the earlier game, there is more of an economic emphasis rather than conquest. Also, the players in Imperial are investors in nations rather than being the nations themselves and control of the nations can change as the game develops. Anyway, the purpose of the game is gain the best return on your investments by issuing bonds in the six major powers of the time, earning interest as the game progresses and increasing the value of the bonds as the powers expand their influence in Europe. This is done by building factories, armies and fleets and expanding into neutral territories / seas. Once a particular nation has progressed to a certain level, the game ends and the value of bonds and cash is evaluated to see who was the most successful investor. Imperial is quite a rich game with a fair amount of strategy. Our game started with most people opting to build a factory, producing armies/fleets and then moving into new territories. One downside appears to be if you lose control of a nation, it can be difficult to get it back and, in the meantime, you are just a spectator waiting for others to take their turn. Nige and Phil spent a fair bit of the early game playing ping pong with Italy. I controlled France for quite a while and made some reasonable progress but also looked to invest in Austria-Hungary and Great Britain. When I eventually lost control of France, I was also lacking cash which wasnâ€™t looking good. However, after a fairly extended negotiation with Mark G (O.K very extended, as Mark wasnâ€™t sure who was screwing him the most with their helpful advice â€“ Me or Nige/Mark K), he made the right choice and opted to invest, bringing me some cash and the ability to issue another bond. Austria-Hungary looked for much of the game as though it was going to end up being the most powerful nation and Mark K was a heavy investor there. However, Mark G managed to promote Great Britain sufficiently to end the game in their favour and my spread of investments in the leading four powers gave me the win. 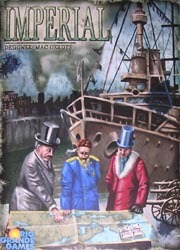 I enjoyed Imperial quite a bit but some of the others were less enamoured with it. It did take us about 3 hours and the potential problem with players having nothing to do and no cash to recover is an issue. The advanced set up is supposed to help in this regard and, with fewer than six players, the possibility of it happening is reduced. Still, it worked for me and Iâ€™d like to try it again particularly if there were only four of us. The first session of 2007 saw us giving a first try to Tempus, Martin Wallaceâ€™s Civilisation-like game. The game is played over ten rounds (or eras) and in each round players get a certain number of actions according to how far their civilisation has progressed. At the start, you only get 3 but by the end this has risen to 6. Choices of action are between moving, having babies, fighting, having an idea and building a city. The ultimate aim is to spread out to as many parts of the island as you can and build cities, as these are the way you get victory points. Each non-mountain location you occupy is worth 1 VP and each city you have is worth between 2 and 4 VPs. The only other way of getting VPs is by developing the flight ability in the last round, which yields 3 VPs. The game is intriguing and does a good job of building in intensity. At the start, you donâ€™t get to do much but as you develop, you gain more flexibility and new innovations allow you to do other things. At the end of each round, the player who has made the most progress gets to move to the next level of development and this gives an advantage over everyone else for the next round. However, the advantage only lasts for one round as everyone catches up with the leader at the end of the round and before working out who progresses further. This is an elegant mechanism and ensures people donâ€™t fall too far behind. The multiple use of the idea cards is also nice and gives a fair bit to think about in whether to use cards for their ability or to do battle or to try and win the progress advantage at the end of the round. All in all, a very good game and one we all enjoyed very much. 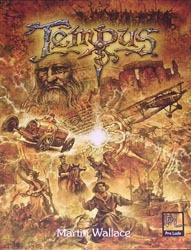 That said, we all agreed that we needed another game to really get to grips with it. The rules are pretty simple but the impact of some of them eluded us until too late. Nige and I made big mistakes in the placement of our first cities. Fighting was kept to a minimum as it seemed expensive but the advantages at the end are a bit more critical than I first thought. We did have one big battle against one of my 3VP cities. Mark G decided to try his luck and I picked the hill terrain for idea cards. This was the only terrain that did Mark any good and we thought he had won the battle much to the amusement of Nige until I realised, as we were removing my city, that I had miscounted my defence value and weâ€™d actually tied (and ties fall in the defenderâ€™s favour). A sigh of relief from me. The end was extremely tight between Nige, Phil and me, but a last minute religious conversion of one of my followers by Nige proved critical and gave him the win by just a single point. Excellent stuff and this sets the bar pretty high for the rest of the year.